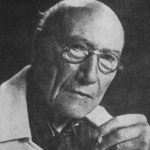 Andre Gide was a French author and winner of the Nobel Prize in Literature in 1947 “for his comprehensive and artistically significant writings, in which human problems and conditions have been presented with a fearless love of truth and keen psychological insight”. Gide’s career ranged from its beginnings in the symbolist movement, to the advent of anticolonialism between the two World Wars. "Through loyalty to the past, our mind refuses to realize that tomorrow’s joy is possible only if today’s makes way for it; that each wave owes the beauty of its line only to the withdrawal of the preceding one." "To read a writer is for me not merely to get an idea of what he says, but to go off with him and travel in his company." "It is easier to lead men to combat, stirring up their passion, than to restrain them and direct them toward the patient labors of peace." "It is unthinkable for a Frenchman to arrive at middle age without having syphilis and the Cross of the Legion of Honor." "What would there be in a story of happiness? Only what prepares it, only what destroys it can be told." "There is no prejudice that the work of art does not finally overcome." "Art begins with resistance – at the point where resistance is overcome. No human masterpiece has ever been created without great labor."